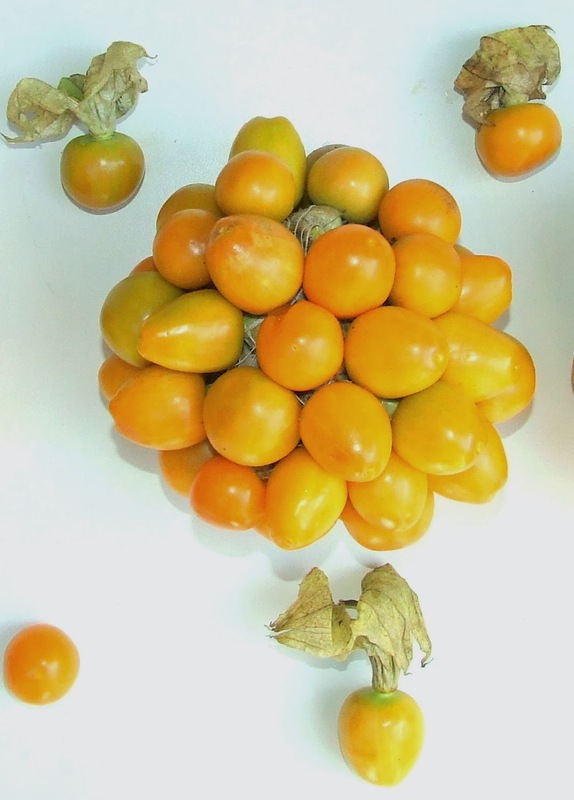 I have always been fascinated by the lovely yellow colour and flavour of Cape Gooseberries and also by the way they are bunched together into a perfect round with berries neatly spaced and aligned on the outer circle. A work of art no doubt! This cherry sized yellow fruity berry was originally cultivated in the Andes where they are still grown today. The round fruit is enclosed in a papery husk called “cape” which provides a natural wrapper for storing the fruit. I love making jam with seasonal fruits as much as I love to use them in bakes. Last week some bunches of Cape Goose berries were bought with the intention of adding some seasonal fruit to the menu. I reserved some for making Jam and also to bake a cake. 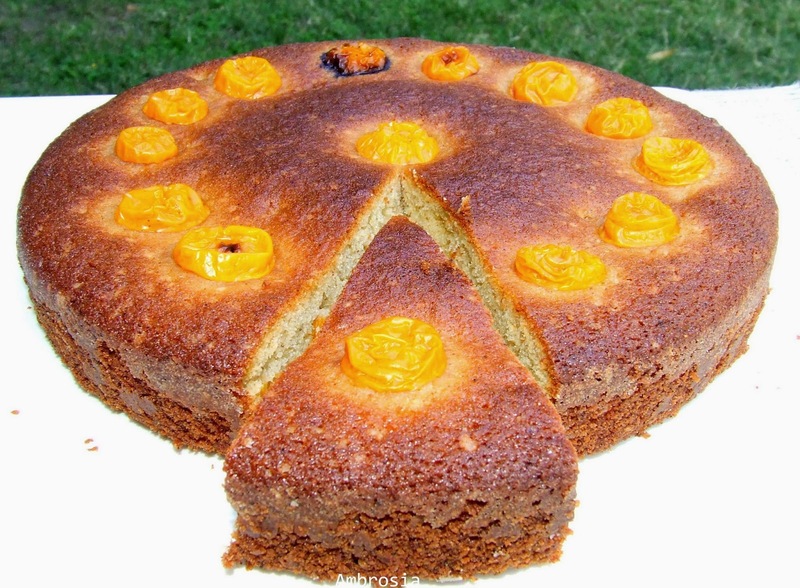 Adding fruits to cake gives a good feeling. It is like adding some “health” to the cake. Cape Gooseberries have a lovely aroma and are full of juice. The experiment resulted in an adorable cake. 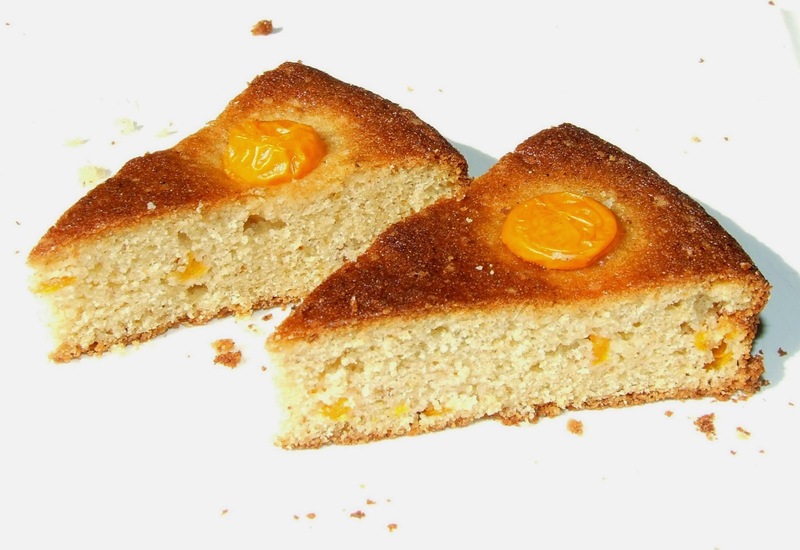 I had baked a Cherry Cake some time ago. I used the same recipe. 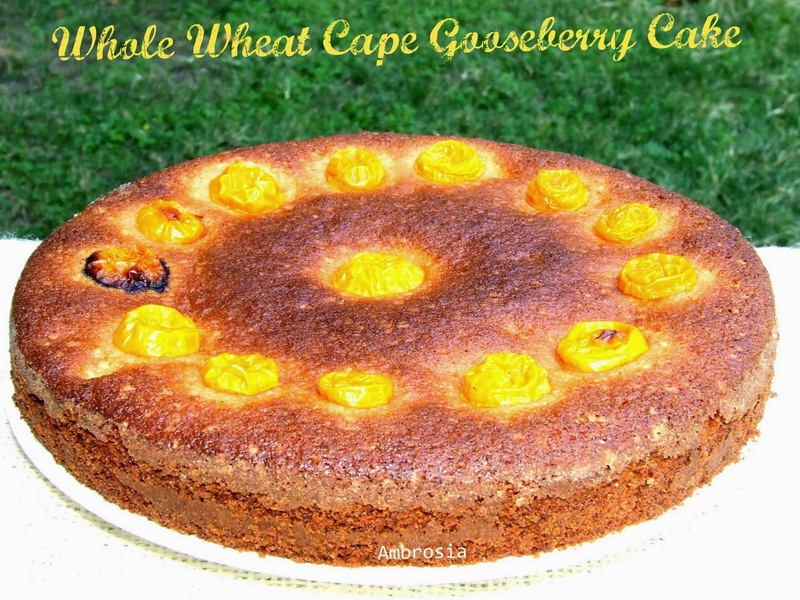 I used whole wheat flour in this cake along with almond meal. The cake was fruity with the lovely crunch contributed by the seeds of the berries. Almond meal made the crumb soft and grainy. 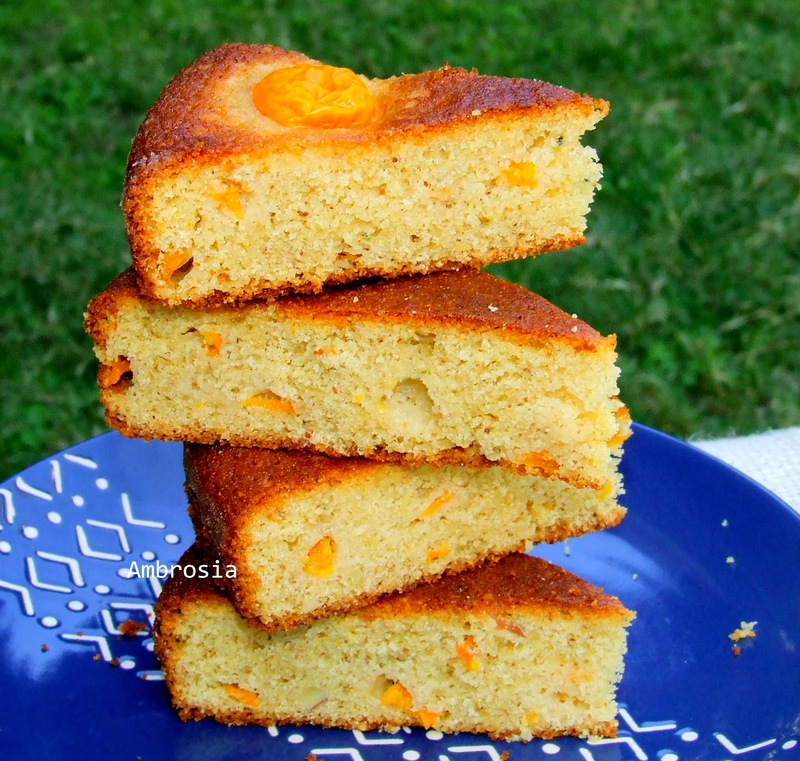 It was a colourful, flavourful and healthy cake. Take about 14 cape gooseberries, cut them into half. Place the cut upper halves on a clean kitchen towel so that the juice is absorbed. Chop the lower halves and the remaining berries into small pieces. Beat the white of the eggs till stiff. Add sugar. Add yolks. Beat further till fluffy. Melt butter in a saucepan. Add butter, milk and vanilla essence to the egg mix. Whisk together whole wheat flour, almond meal, salt and baking powder. Add flour mix to the egg mix and stir gently till well incorporated. Fold in chopped berries (not the ones cut into half). Bake in a preheated oven at 200 degrees C for 15 minutes. Remove the cake pan from the oven and quickly arrange the halved berries with cut side down on the cake. Return the cake to the oven and bake further for about 20 minutes or till a toothpick inserted in the center come out clean. Tent the cake loosely with a foil if the top browns too fast. Let the cake rest in the pan for 15 minutes. Remove and cool in the wire rack. Slice next day. Wonderful idea. Very unique recipe. A lovely looking and most exotic cake. We have cape gooseberries growing here at the moment. They are very easy to grow from seeds. They will grow in just about any conditions and are very prolific. Never thought of using these berries in a cake. Admire the way you make your bakes so healthy and guiltfree.